The 18 deaths on Everest are a small fraction of the 5200+ fatalities across Nepal due to last Saturday's earthquake. The tragedy of the avalanche at Everest Base Camp is dwarfed by the catastrophe facing the residents of Nepal's major cities. In the next few weeks, when the Western climbers return to the comfort of home, Nepalis will continue to reel from the destruction, recovering bodies of those who perished and beginning to rebuild the vast tracts of the country that lay in ruins. If you've been moved by the stories of the destruction in Nepal, please consider donating to the relief efforts. Both the Huffington Post and Charity Navigator have a useful index of charities providing earthquake-related aid in the region. For the last five weeks I've been checking the International Mountain Guides (IMG) Everest blog with religious devotion. Until a few days ago, Luke Reilly, my guide for my mountaineering expedition to Ecuador in January, and Nic Dumensil, a fellow climber on that Ecuador trip, were on Everest gearing up for a summit attempt. Through blogs and Facebook feeds, I followed Luke and Nic as they acquired climbing permits in Kathmandu, trekked across the Khumbu Valley, climbed Lobuche to acclimatize, and settled into base camp. It was exciting to read the dispatches and cheer them on from afar, but with Saturday's 7.8 magnitude earthquake and the resulting avalanche, my buoyant ritual became a grim vigil. Nic and Luke are safe, as is the entire IMG expedition, but 18 other climbers are dead and many more are critically injured. All the Everest climbing expeditions are retreating back towards Kathmandu, which is itself a difficult proposition because much of Nepal's infrastructure has been destroyed. This wasn't your typical avalanche. Most avalanche fatalities are due to asphyxiation due to burial (source), but most deaths in this avalanche were due to trauma. Sure the video shows a powder cloud, but photos of the aftermath of the avalanche only show a dusting of snow on broken tents and scattered equipment. What's different here is that a blast wave, and not a tide of snow, caused the destruction. You can actually see evidence of this in the video: Notice how the prayer flags languidly hang from their tethers (before 0:18 in the video) only to be drawn horizontally by the gust front (0:22 and later) as the avalanche approaches. According to first-hand accounts, this "avalanche" was spawned when a tenuously perched serac broke free from its ridge and plummeted over 2300 ft (700 meters) to the valley floor. 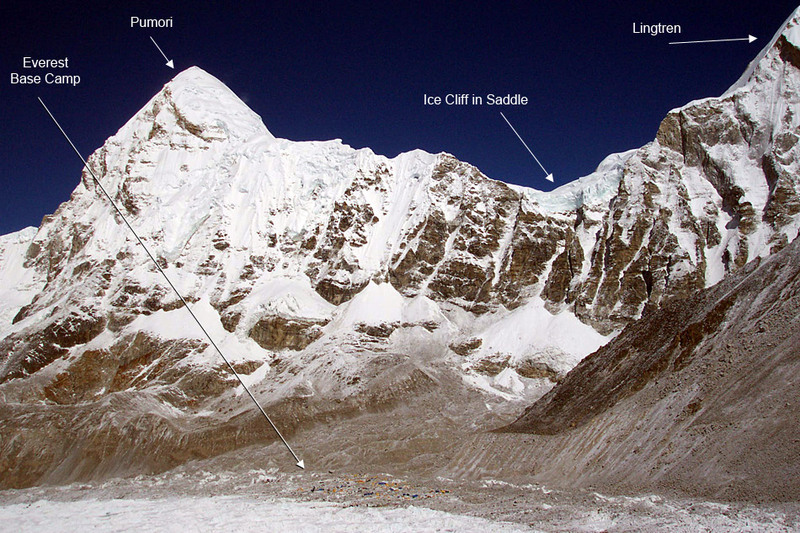 The photos on the the IMG Everest Blog (here and here) show the serac ("ice cliff") that caused all this destruction. 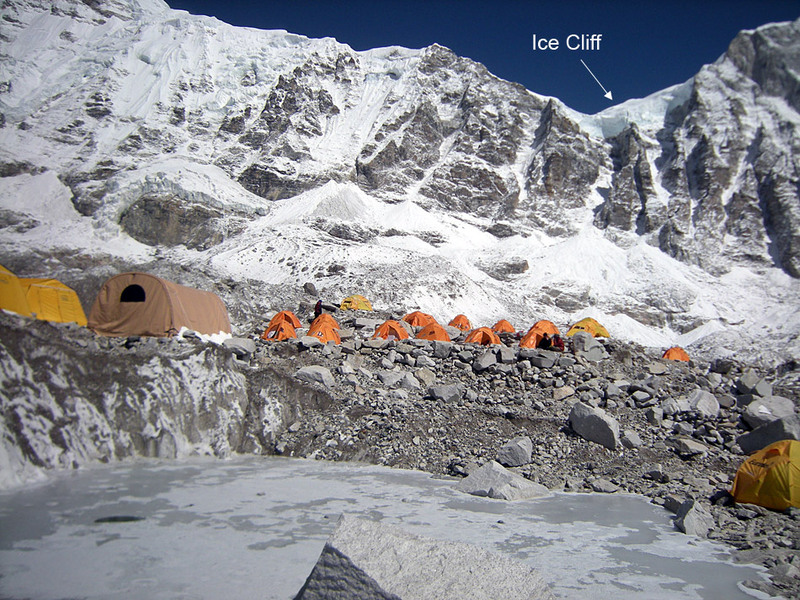 When the serac hit the valley floor, the energy released caused a shockwave, which rocketed 1.9 km (1.2 mi) towards base camp, over the protective walls of rock and ice that normally shield the camp from avalanches and rock falls. So what is a serac? Perhaps not surprisingly, "serac" is a just fancy word for a beautiful chunk of ice that will eventually break loose and hurtle downhill. Seracs are usually seen at the terminus of glaciers or wherever a glacier flows over a ridge or convex feature on a mountain. Once a section of ice detaches from the main body of the glacier, the ice becomes a serac. Thereafter, mechanical stress - due to glacier movement, snow loading, or vibrations caused by human or seismic activity - or melting due to solar heating can cause the serac to break loose and hurtle downward. Below you can see a photo I took on the Nisqually Glacier of Mount Rainier in 2013. You can see seracs in the top center of the photo which will eventually break loose and join the pile of rubble in the center of the photo. Based on a crude analysis of the IMG photos, the serac measures 330m (1100 ft) in length and 92m (300 ft) in height. Approximating the serac as a triangular prism, the ice in the serac weighs 1.3 billion kilograms or 1.4 million tons. Using simple conservation of energy equations, released from a height of 700m (2300 ft), the ice fall would impact the ground at 180 mph (80 m/s) with an energy of 9.0 trillion joules, or 2.0 kilotons of TNT. (In the rarefied atmosphere of the Khumbu Valley, energy lost due to drag is insignificant.) The energy released is equivalent to 66% of the destructive power of the Halifax Explosion, which killed 2000 people, and 14% of the Little Boy atomic bomb dropped on Hiroshima. It's no wonder now that the avalanche was so deadly and a miracle that more people weren't killed. There have been some incisive editorials in the last few days challenging the wisdom of mountaineers to attempt a mountain as dangerous as Everest. Explaining why climbers challenge themselves in these deadly environs is a complicated task, which I'll leave for a later time. For now, consider that 18 people died when the equivalent of a tactical nuclear weapon was loosed only a mile away from them. Imagine the terror of those in areas closer to the epicenter of the earthquake, and the helplessness the survivors must feel as they try to recover from this disaster. I, for one, have contributed to the relief efforts in Nepal, and if you feel so compelled, check out the links at the top of the article for a list of charities involved in the recovery efforts.